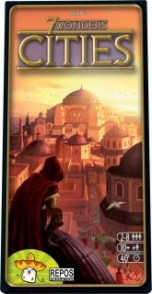 7 Wonders â€“ Cities is the new extension of the award-winning 7 Wonders game. For an added challenge, you can play all three versions together [7 Wonders, 7 Wonders - Leaders and 7 Wonders â€“ Cities]. Adds another player to the game and some interesting twists. I especially like the abilities to put a player in debt and avoid battles.